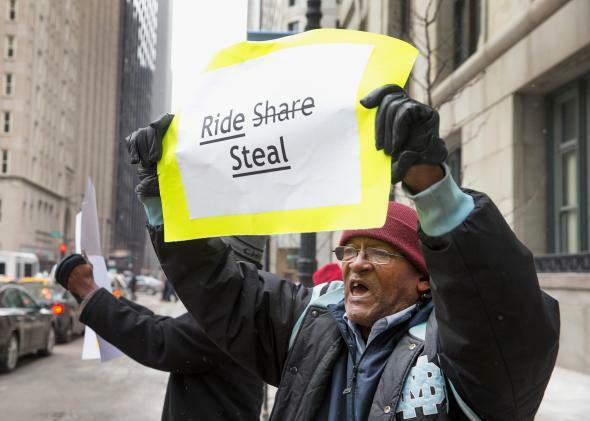 A taxi driver protests “ride-sharing” in Chicago. Uber, you might recall, is very rich. It’s racked up billions of dollars in funding for a valuation somewhere in the realm of $40 billion. Lyft, its main rival, isn’t doing too shabbily either. Late on Wednesday, Lyft confirmed a new $530 million funding round that brings its valuation to more than $2.5 billion. There are lots of reasons for those eye-popping estimates: good service, smart algorithms, aggressive expansion. But another one, which often gets forgotten, is the employment agreements both companies have with their drivers. On Uber’s and Lyft’s platforms, drivers are treated as independent contractors; they are responsible for paying on-the-job costs like gas and vehicle maintenance out of their own pockets and don’t receive any benefits, which translates to huge savings for their companies. Now though, Uber and Lyft are facing a serious legal challenge to the independent-contractor portion of their business model—and, by extension, the rest of the “sharing economy” is as well. Historically, the line between employee and independent contractor has been easier to draw. In California, independent contractors are generally treated as workers who serve multiple clients, have a high level of control over their work, and complete specific jobs over a limited period of time that fall outside the usual scope of their current employer’s business. Employees, by contrast, tend to be employed, supervised, and paid for a long period of time by the same one or two employers; their hours are more regular, and the way they do their work is more regimented. The legal problem for Uber and Lyft is that, by these standards, their drivers seem to fall squarely in the middle. Their hours are flexible—but only to a point. Uber, for example, has threatened to suspend the accounts of drivers who accept less than 90 percent of rides. The same is true of drivers’ control over their work. Uber and Lyft might not make drivers wear uniforms, but the companies do instruct them on other points—how to interact with passengers, what kind of music to play during rides—and threaten to deactivate drivers who don’t meet standards. This last point—the ability to “terminate” drivers who don’t comply with expectations—is perhaps the most compelling argument that Uber and Lyft drivers ought to be considered employees and not contractors. Both judges note that California’s highest court has previously described an employer’s “right to discharge at will, without cause” as “strong evidence in support of an employment relationship.” What’s more, existing California law presumes that contractors don’t need the same protections as employees because they have significantly more bargaining power; if one job doesn’t work out, they can take their services elsewhere. But it’s an open question whether Lyft and Uber drivers who work essentially full time on the platforms—the two dominant ones in on-demand ride services—really can do this. “As should now be clear, the jury in this case will be handed a square peg and asked to choose between two round holes,” Chhabria wrote. Of course, the cases have huge implications not just for Uber and Lyft, but for all the companies in Silicon Valley’s so-called sharing economy that have built their models on contract workers. Handy, a cleaning service company, is facing a similar suit, and complaints about contract status have also dogged Amazon’s Mechanical Turk. More than anything, the judges’ rulings on Uber and Lyft highlight just how fragile their seemingly huge businesses still are. While it’s easy to look at Uber’s billions and declare that it has already won, it’s equally fair to argue that “the gig economy won’t last because it’s being sued to death.” In short, no one really knows what might happen. But the future is undoubtedly less cut and dry than these companies would like to think. And for Uber, the unfortunate reality is that you’re probably not worth $40 billion if you have to pay benefits and gas bills.